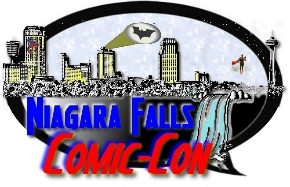 The Niagara Falls Comic Con is set for Saturday, June 9th, 2012 at the Scotia Bank Centre! Vendor and ticket information is available on the site…! If you’re an artist or vendor looking to secure space, visit the site for details. Spaces are limited, so book fast! No comic guests announced yet, but they have wrestlers if that’s your thing. You may recall that the event, organized by Niagara Falls’ Pulp Comics officially launched last year on July 9th at the Dave & Buster’s in Clifton Hill, Niagara Falls. Leonard Kirk was there. I don’t understand why they have a picture of the SLG booth at San Diego Comic Con on their site though.